Two Fluid Brake Actuators are hydraulic power braking units. 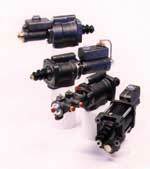 Power braking is accomplished by combining a booster and a master cylinder in one unit. The booster uses power developed from the main open-center or closed-center hydraulic system to provide a hydraulic boost to the master cylinder. A hydraulic feedback system within the unit gives the operator pedal feel directly proportional to the brake pressure.